What Size Sheaves should be Selected? 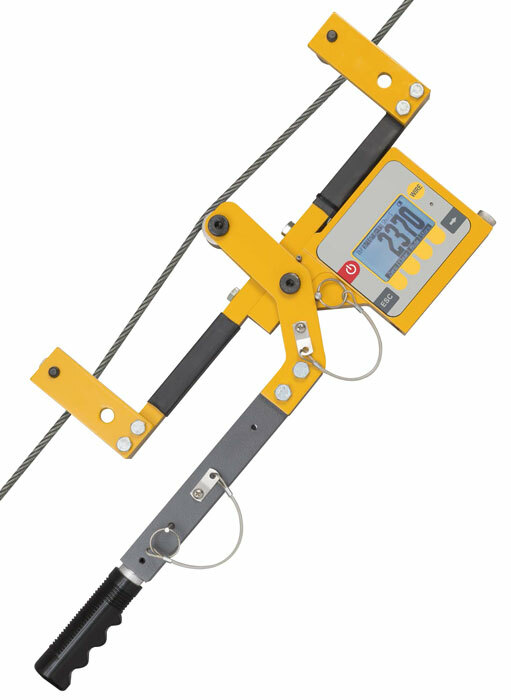 The Check-Line CTM2 Digital Cable Tension Meter quickly measures tension in guy wires, zip lines, guardrail cable and utility lines. It installs, measures and removes in seconds. 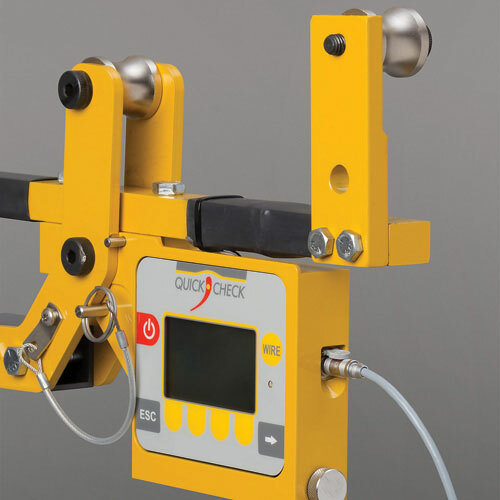 The CTM2 features a precision loadcell for highly accurate measurements that do not require lookup or correction tables. 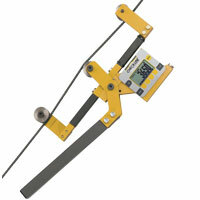 The CTM2 can be placed on a cable, measure its tension, and removed in under three seconds! There are no complex lookup tables, no conversion charts. The operator can quickly select from 20 different wire sizes and types stored in CTM2's memory. The Check-Tensioning mode graphically displays the current and target tensions for extremely quick setting of line tension. Even the infrequent battery changes are quick. 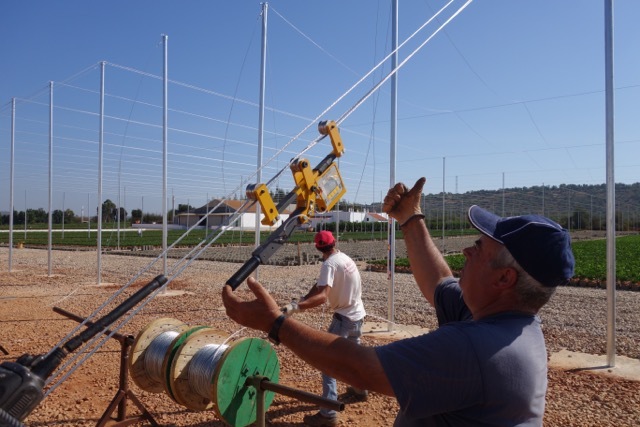 The CTM2 is used in many industries to ensure proper tensioning. 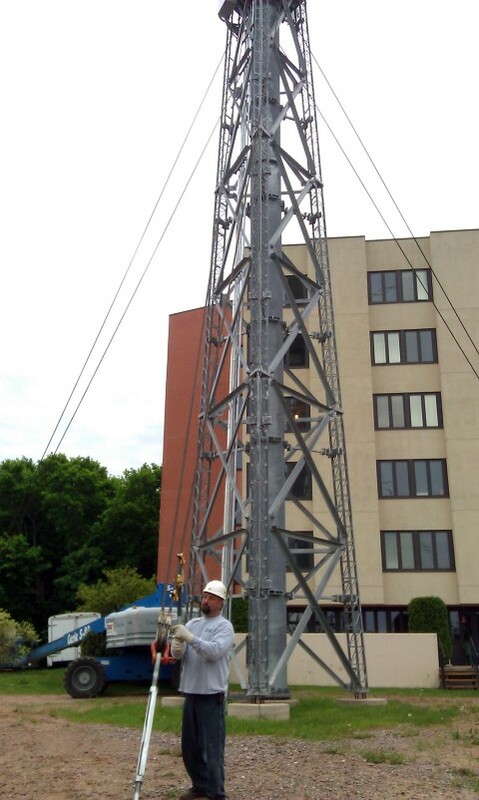 Typical applications include tower and stack guy wires, zip lines, pretensioned cable barriers, bridges, elevators, winch rope, overhead electric transit wires, fall arrest systems, aircraft cables and utilities. Calibrate each cable diameter installed with the most appropriate sheaves. If two cable types are used of the same diameter (e.g. ½” 7x7 and ½” 6x19), calibrate each type independently if accuracy is critical. Recalibration: At user discretion. Commonly 24 months but should be more frequently with heavy use. Factory recalibration conducted typically in 2-4 days. The CTM2 can be calibrated with a customer supplied sample if none of the factory calibrated materials are suitable. In this case a 10 ft. sample must be supplied (non-returnable). 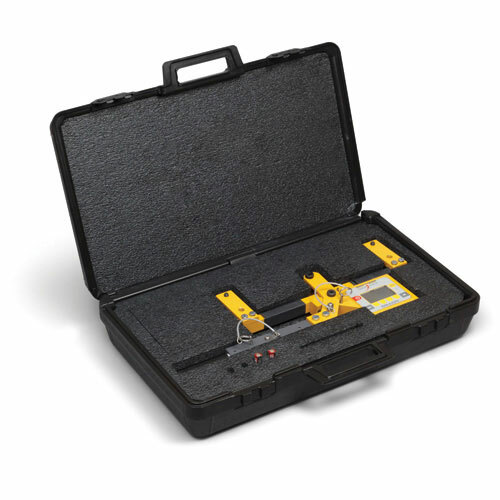 The CTM2 is supplied as a complete kit including tension meter, instruction manual and calibration certificate in a heavy duty carrying case. Sheave range Sheave accommodates rated cable size and 1/2" smaller. 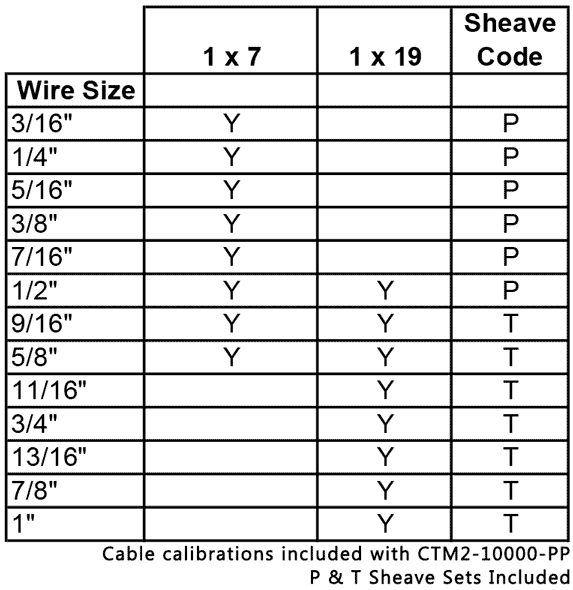 Sheaves are not compatible with larger wire sizes - order additional sheaves for wire sizes. Three sheave sizes are available. For most applications one sheave set for the entire assortment of wire they tension will be sufficient. If you need to check tension in both 3/16" and 3/4" rope, then they should order two sheave sets. 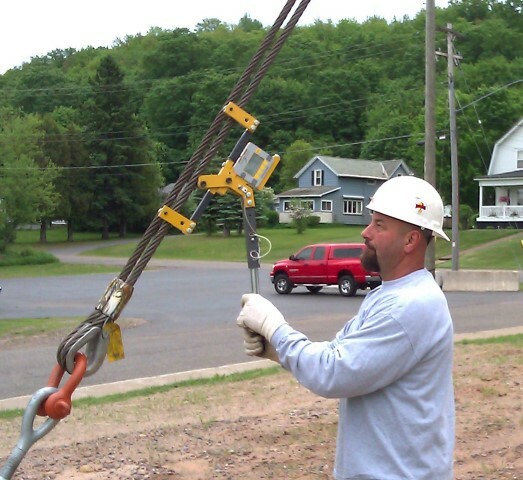 The operator must use the appropriate sheave set for the wire size and calibration stored. Changing sheaves sets takes about two minutes with the included wrench. 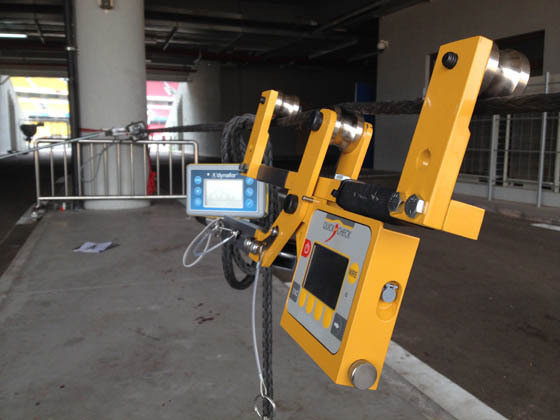 The CTM2 needs to be calibrated in advance for each wire diameter / wire construction you will be measuring. 1 calibration is included at no charge, each additional calibration is $120. Calibration load may be changed if desired. Higher calibration loads are limited by max. capacity of the sling. If the desired wire size/type does not appear, customer may supply 10 ft. sample of wire to determine if a custom calibration sling can be created (non-returnable). Consult factory for details. 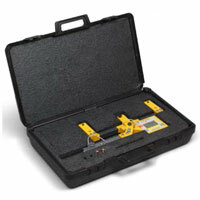 CTM-SH-S Code S Sheave for 1/4" to 3/4"
CTM2-10000 Cable Tension Meter, includes calibration on one factory sample. SPECIFY diameter and wire construction.